The approach, media and techniques I use in my images are similar from one project to the next. I perform all my own work from making the photographs to editing, processing and printing the finished images. The images here include a mix of analog and digital processes. The Texas Rangers project and Graflex Portraits were captured using analog technology and Roadside Attractions and Squared Colors are entirely digital. The Graflex Portraits were made in 1985 using a 4x5 Speed Graphic camera that I bought for $75 and a 150mm Rodenstock lens. The 4x5 Tri-X sheet film negatives were scanned using an Epson 4990 scanner, creating an approximately 50 megabyte file and then processed in Lightroom and printed on Epson Velvet Fine Art paper using an Epson R2400 inkjet printer. The photographs of Texas Rangers were made in 1990 using a 35mm Nikon F3, using Tri-X, T-Max, Ilford HP-5 and FP-4 films. These were scanned with a Noritsu and processed in Lightroom. I use a toning pre-set in Lightroom that mimics a medium strength sepia-toned image. 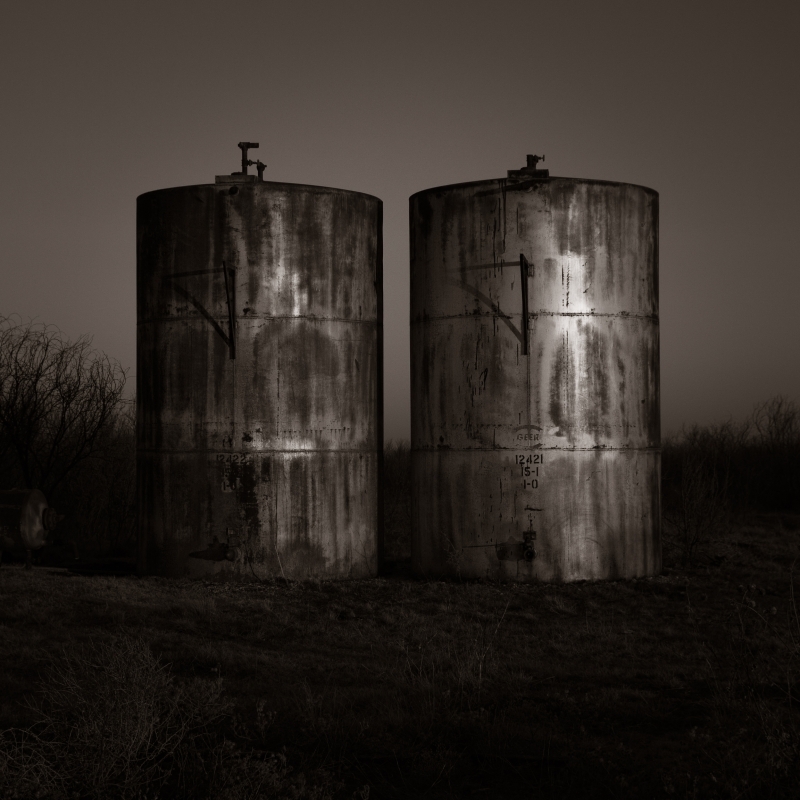 Roadside Attractions is a new project and ongoing. It consists primarily of images I have taken while traveling during work. I drive a lot and see wonderful things on the side of the road. When the light gets interesting I stop. After a while I noticed all had some man-made object in them, storage tanks, towers, buildings, etc. It is entirely digital, captured using my Sony R1 and Pentax K20D. The original files are in color and I convert to black and white (grayscale) using the native channel mixer in Lightroom. I process my images very little, don't use layers and never add or remove anything from the photograph. I do crop as I like square images. Most of the processing involves curves, which modifies the tones, sharpening, light contrast adjustments and the occasional dodging and burning or using a gradient filter when appropriate. I believe in simplicity and little staging. I like being able to photograph what is discovered and always find it interesting that two photographers standing next to each other rarely take the same photograph. The world and its people are wonderful and I want to record that. People are transient and the simple act of making a photograph of an individual makes them timeless. I see in black and white and usually find color distracting. I'm an explorer, but as the world becomes larger and more complex I find refuge in the simplicity of my photographic images. My negatives and transparencies from 30 years ago still look great, with no fading or loss of quality. My 35mm, 120, 4x5 and 8x10 negatives scan very well and the prints I've made with my Epson inkjet printer are better than the original gelatin silver prints. Additionally, the choice of papers is remarkable; the newer ones mimic the muted gloss of gelatin-silver and I also enjoy using watercolor-type papers. I make all inkjet prints to archival standards using various papers. The titles accompanying my photographs are simple, revealing the location and subject; the rest is up to the viewer.